Heavy rain has already fallen over the southern half of ENC this afternoon and continues through this evening along a stationary front. Rain will begin to diminish this evening with only small isolated showers lingering through early morning. 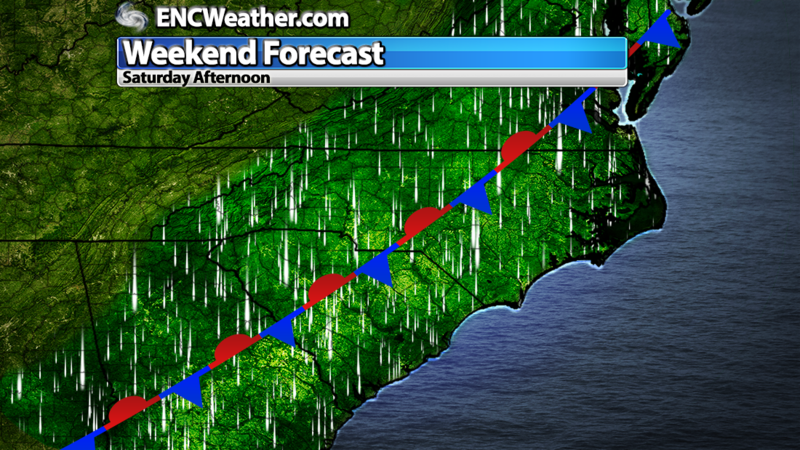 The front will become quasi-stationary Saturday as a series of shortwaves travel trough the area. This will bring another chance of widespread showers and thunderstorms to ENC with some flooding concerns after today’s rain. High temperatures Saturday will be limited by cloud cover and precipitation (upper 70s) though some areas might see a brief break in the clouds early allowing high temperatures to reach the low to mid 80s. A quasi-stationary front setup over North Carolina will bring another chance of showers and thunderstorms to the area for Saturday. Surface boundary will remain over the region through the first part of next week before moving offshore late Tuesday and away from the region. Scattered showers and storms will be possible near the coast prior to its departure. We will have dry and cooler conditions starting mid-week with highs in the mid-to-upper 70s and potentially lasting through the weekend which will make great weather for the football game next weekend. 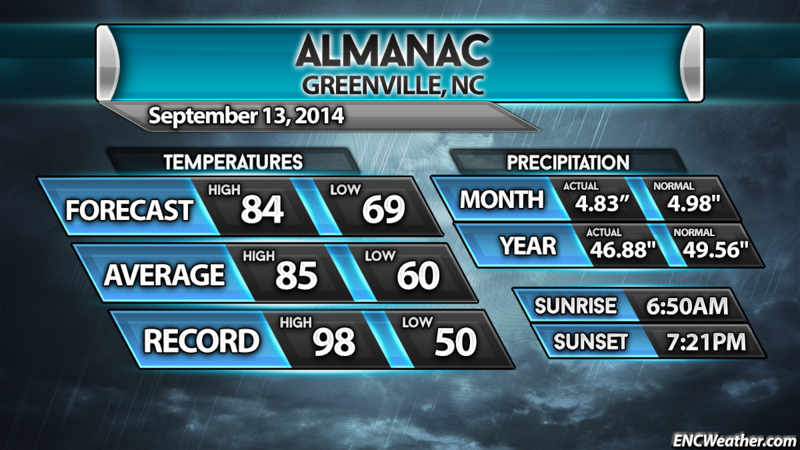 Area almanac for September 13, 2014.